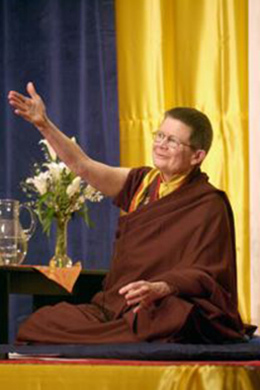 Pema Chodron was born Deirdre Blomfield-Brown in 1936, in New York City. She attended Miss Porter’s School in Connecticut and graduated from the University of California at Berkeley. She taught as an elementary school teacher for many years in both New Mexico and California. Pema has two children and three grandchildren. Pema first met her root teacher, Chogyam Trungpa Rinpoche, in 1972. Lama Chime encouraged her to work with Rinpoche, and it was with him that she ultimately made her most profound connection, studying with him from 1974 until his death in 1987. At the request of the Sixteenth Karmapa, she received the full monastic ordination in the Chinese lineage of Buddhism in 1981 in Hong Kong. Pema is interested in helping establish the monastic tradition in the West, as well in continuing her work with Buddhists of all traditions, sharing ideas and teachings. She has written several books: “The Wisdom of No Escape”, “Start Where You Are”, “When Things Fall Apart”, “The Places that Scare You”, “No Time to Lose” and “Practicing Peace in Times of War”, and most recently, “Smile at Fear”. All are available from our store.